This release contains enhancements, bug fixes, and language translation updates that improve the usability of Manuskript. Extra export formats such as ePub, OpenDocument (LibreOffice), and DocX (MS Word) are available in manuskript if you also install pandoc. Currently only pandoc version 1.x is supported. An issue has been created to track v2.x support. Being able to rearrange “items” within the “World” tab in this version is amazing beyond belief! Thanks for the words of appreciation. Credit for enabling the moving of world items goes to JackXVII. First : Many thanks for your software. This is my first time at writing and having tried other software I found yours to be the best. I first started with your 0.6.0 version and have just downloaded 0.7.0. Being new I have never used the DEBUG on the navigator menu but I have noticed it is not there on on version 0.7.0, and I can’t find how to activate it. Is this intentional or has my install gone wrong? If you wish to enable DEBUG you will need to run Run Manuskript from Source Code and change the value of SHOW_DEBUG_TAB in the manuskript/mainWindow.py file. Sorry, missed that……..again thank you and keep up the good work. Very good to see this new release. I used v.0.6 to begin work on a book I’ve been contemplating. I found it very useful to develop the characters and organize the material. I do hope that you will continue to develop this tool as it is certainly the best in the open-source world. I liked yWriter but it was a bit too limiting in it’s organization. Manuskript is a significant step up when it comes to organizing and writing. It’s a bit slow on older machines and has a bit of a problem loading bigger files. 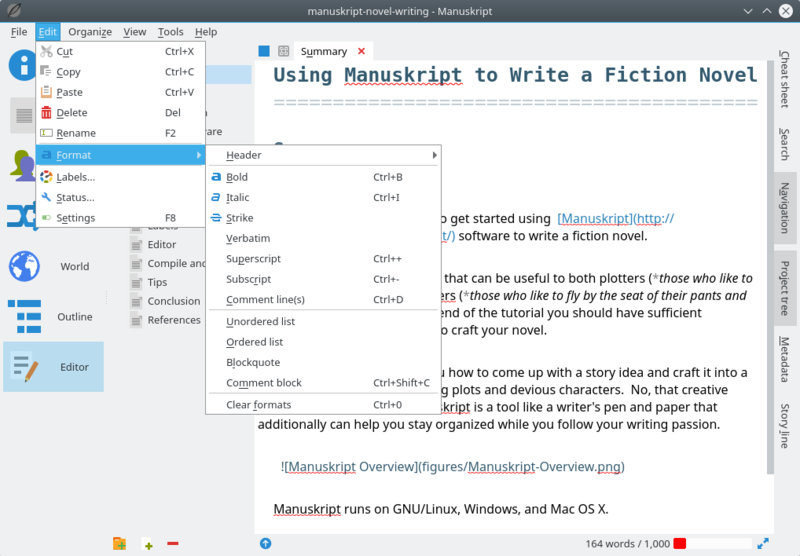 It’s still preferable to yWriter and is definitely the best free program of it’s kind. Here’s hoping 0.8 won’t take as long to come out as 0.7 did. Just curious why not use “onefile” with pyinstaller so there is no console popping up as well as having all of the files reside in the exe so you can move the location of exe file and not be dependent on having the other files in the same directory.. And only suggestion I have is put a link in the help drop down to your help page or make an offline one. It took me a second to find out how to change font size when editing and a dropdown DOC link in the help button would have been intuitive. Thanks for the software it is amazing and just what I was looking for after hours of searching, you guys are doing great work. ‘Glad you enjoy the software. Regarding PyInstaller it’s been a long time since I looked at this. If I recall correctly there were some performance penalties and it was more difficult to get console output if the “onefile” option was used. Manuskript is still evolving and the console output is extremely valuable when triaging issue reports. I do really love this poweful piece of software that has turned my old Chromeboox with Gallium Os onboard, a magnificient writing station. I’m really glad for this great opportunity of writing in an organized manner. Since i’m really interested in the snowflake function, i’m considering a donation for all the effort spent in this software. And last but not least, i’d like to translate all the menus in Italian! Why not? Good job Jedack (yiu’re the Admin, aren’t you?) ! Thank You! ‘Glad to hear that the software is working well for you and has breathed new life into your old Chromebox. For information on translation see Translate Manuskript. See also the Contribute link. The project admin (and original creator of Manuskript) is Olivier Keshavjee. I am simply a developer (and Manuskript user) with additional privileges which enable me to help Manuskript move forward while Olivier is busy with other things. Could you add Encrypt function for projects and may Turkish dictionary for spelling? Feature Requests can be viewed, created, and tracked at Manuskript Issues. See Adding a Spellcheck Language Dictionary to Manuskript to learn how to add a Turkish dictionary. I’m posting this here because I don’t want to make a GitHub account and have yet another account and password to bog me down. In regards to the requested Dark Mode/Theme( https://github.com/olivierkes/manuskript/issues/388 ) while things might work in Linux like that, on Windows things are a lot different. Dark Mode was a joke before the last update and frankly still is somewhat of a joke even after the October update. For windows, at least at the present, the program must supply it’s own dark theme. Hell, even MS Office doesn’t use a windows flag to turn on the inbuilt dark themes it has, and that’s an MS product – MS is bad at doing dark mode. The Manuskript web site is not well positioned for issue handling which is why we track issues on GitHub. In an effort prevent your comments from being lost, I have copied these to the appropriate GitHub issue. Excellent job! I started out using LibreOffice for my project and just figured to search for tools that are available out there for writing. Will definitely make the process and management easier. When is this going to be included in linux software repos? Thank you for the appreciative comment. We try to make Manuskript a helpful tool for writers. Regarding being included in Linux software repositories, that is up to the individual distributions and the volunteers that build and maintain the repo packages. Wow. This could become an amazing software. Unfortunately not working stable and/or very slow for me. But it has everything I was always looking for and already feels better than two other writing programs I’ve been using. Keep up the good work! We need more details than “not working” or “not stable” in order to improve Manuskript. Please report specific issues and provide additional details including a good description of the problem, the manuskript file and OS version used, and the steps to reproduce the problem. Issues are reported and tracked at Manuskript Issues. Great web site you have here.. It’s difficult to find excellent writing like yours nowadays. I new to Manuskript and I already love the interface and features! My concern is that I may have installed it incorrectly as I have a command prompt opening at the same time. Is this intentional, and if so can it be hidden somehow? If not, thoughts about where I went wrong in my install? Thanks! I assume this is about the Windows version. If so then yes, a command prompt is opened when manuskript.exe is run. The command prompt should contain all the debug output which is extremely useful when reporting and troubleshooting issues. If you’re on Windows 10 you can create a new Desktop Workspace and put Manuskript’s command prompt in to hide it. Press “Windows Key + Tab” (A Windows Key is between CTRL and ALT at the bottom left on a keyboard) => Hover your mouse cursor over the Manuskript command prompt then “Right Click” => Select “Move to” from the popup context menu => Select “New Desktop”. This will create a Desktop 2 workspace and move Manuskript’s command prompt there. You can switch between your Desktop workspaces by pressing “CTRL + Windows Key + Left/Right Arrow”. Dont have much constructive criticism to add other than I love this app! Thank you so much!!!! !